We Qingdao JIUHE Heavy Industry Machinery Co., Ltd. was since year 2011, is one high-tech company with research、development、manufacture、sales and after-sale service, specialized concrete machinery, only focus on whole series concrete boom pump truck from 25m to 63m, concrete truck mixer from 3m3 to 20m3, concrete placing boom from 15m to 52m, stationary concrete pump from 20m3/h to 100m3/h, concrete batching plant from 25m3/h to 240m3/h. Our company have three brach workshop, one is only focus on concrete pump truck/stationary concrete pumps and concrete placing boom assamble, one is only focus on truck mixer production, one is focus on boom production and truck mixer production, all of these three factory located in Qingdao city, near to Qingdao sea port, very convinient to ship cargo by sea. we also have many branch at other city of China ( such as Beijing, Hunan, henan, shanghai, zhejiang and so on)、 vietnam、 Philippines、UAE 、Indonesia、Malaysia、Thailand and so on. We also have our professional after-sale team at domestic and over sea, all of our customer don;t worry about after-sale service. Company adopt ISO9001 quality system, high efficiency and good quality of our machine, machine have got CCC, CE and SGS certification. As to concrete mixing machine, Concrete mixing truck is mainly 4m3 and 6m3, while concrete mixing plant is HZS50 and HZS75 to meet the needs of small concrete mixing projects. Concrete pumping machine has various kinds such as trailer concrete pump, concrete mixer pump, truck mounted concrete pump and truck concrete pump boom. JH concrete pumping machine also offer you various choices, our machine has various series to meet different pumping needs of different size concrete. No matter what kind construction, just consult us and we will recommend you suitable model based on your construction. Concrete placing machine has hydraulic and manual type, hydraulic has mobile, stationary and self-climbing three kinds, mobile can be easily put onto specific floor via crane without being fixed, stationary should be fixed with some fixing device, while self-climbing is divided into elevator shaft and floor climbing model. Manual can be operated by manual power to control placing direction. 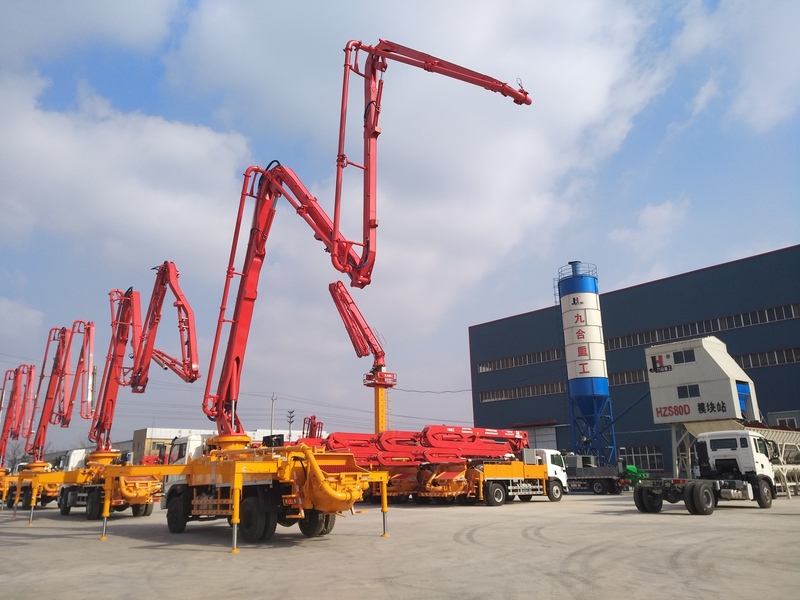 Hydraulic mobile is convenient, hydraulic stationary has bigger concrete placing radius, while manual has competitive price compared with hydraulic models. Other Machinery is mortar plastering machine, sideloder, high-altitude hot-line work car and so on.